According to the stats, this is NUFC’s player of the season for 2018/19 – You may be surprised.. – NUFC blog – Newcastle United blog – NUFC Fixtures, News and Forum. According to the stats, this is NUFC’s player of the season for 2018/19 – You may be surprised.. 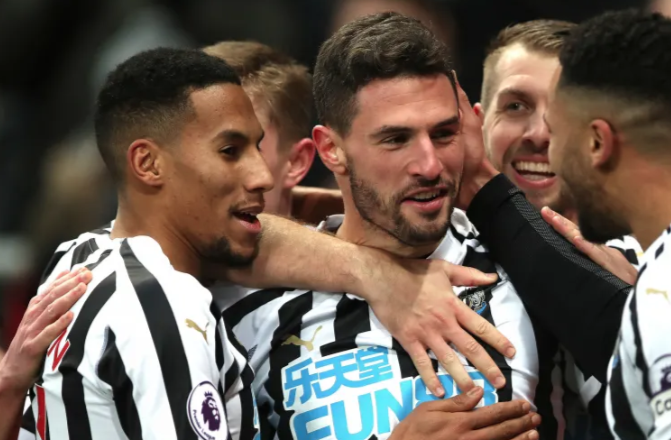 According to ‘WhoScored.com‘ – the largest detailed football statistics website – Fabian Schar has been Newcastle United’s best player across the 2018/19 season. The Swiss international has an average match rating of 7.31 across the 18 Premier League games he’s played this season – a total bettered by no other Newcastle United player. No doubt Schar’s 3 goals and 1 assist has helped his cause, but it’s easy to see why his rating has been so high, with him not only defending admirably, but showing an impressive range of passing from the back, also being a confident and successful dribbler when he decides to step out from the back. It seems a little flawed that Dubravka doesn’t feature (he’s in 15th with an average rating of 6.59), although his costly errors against Spurs and Wolves will have had a huge impact on that mark no doubt. Aside from Antonio Barreca, who’s bottom of the pile after playing just 4 minutes against Spurs, Jacob Murphy, Yoshinori Muto and Joselu are in the bottom three of WhoScored’s merit marks. For me, Rondon is our player of the season, with his all round contribution week in week out along with his 10 goals and 5 assists proving pivotal, although Schar would have been a real contender if he’d shown this form over a longer period. Embarrassing Sunderland fans target Miguel Almiron – but the joke’s on them.. 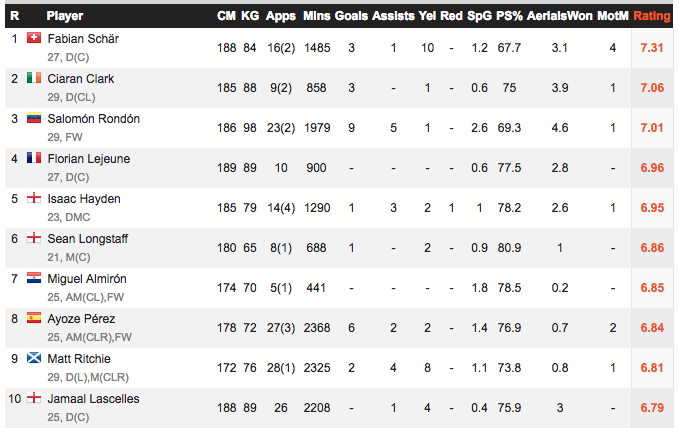 The only thing keeping Schar at the top of that list is his lack of games. His brace against Cardiff no doubt put the spotlight on him, giving us a rose tinted beer goggle view with regard to his performance, but it would be a different story if he’d played all 11 games at the beginning of the season where we gave the impression not so much that we were playing in the wrong league, but actually playing the wrong sport. Check out Ritchie and Lascelles, resident Super Heroes down in 9th and 10th, both having made appearances in the high twenties.